Salugara Monastery also known as Sed-Gyued Monastery is about 6 KMs from Siliguri town. 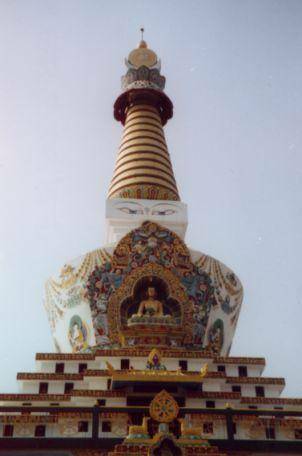 This monastery is famous for a 100 feet Great International Tashi Gomang Stupa built by a Tibetan Lama, late Kalu Rinpoche. Monastery also has a beautiful golden buddha statue. Salugara Monastery has 5 sacred relics and is run by Drodon Kunchab Chodey Buddhist Association. In spite of the beautiful architecture and being perched in middle of lush greenery, this monastery is not thronged by tourist, which makes it great place to meditate and get some spiritual peace.